The city of Homs in Syria has been extensively damaged by government shelling. The Joint Special Envoy of the United Nations and the League of Arab States, Kofi Annan, will continue consultations with heads of governments in the Arab region to seek support for his mission in Syria, his spokesperson said today. “He [Mr. Annan] intends to visit Teheran in the near future as well as Riyadh to impress upon those governments the importance of unity in the international community behind this plan and to stress that this is the only plan in town and it is incumbent upon the Syrian authorities to implement the plan quickly and effectively, and work with the Special Envoy to make sure all its provisions are implemented,” said Mr. Annan’s spokesperson, Ahmad Fawzi, told reporters during a press briefing in Geneva. Mr. Annan – who earlier this month met with Syrian President Bashar Al-Assad in Damascus, where he put forward a six-point proposal to end the crisis – has already visited Cairo, Ankara, Doha, Beijing and Moscow to garner support from Government officials. Mr. Fawzi said Mr. Annan would brief the Security Council on the latest developments on Monday via a video link. Yesterday, President Bashar Al-Assad reportedly said he wanted and would do everything in his power to ensure the success of Mr. Annan’s plan, which seeks to stop the violence and the killing, give access to humanitarian agencies, release detainees, and kick-start an inclusive political dialogue. Mr. Fawzi also noted that Mr. Annan is reaching out to the opposition. He had sent his deputy, Nasser al-Kidwa, to Istanbul where there was an opposition meeting a few days ago and a Friends of Syria meeting, which would start on Sunday. “Mr. al-Kidwa has with him a team from Mr. Annan’s office to talk to the opposition to convey messages to the commanders of the military groups on the ground to appeal to them too to lay down their arms and start talking,” the spokesperson said. In addition, Mr. Fawzi said that the proposal by Mr. Annan specifically also requests the Government to withdraw its troops and to cease using heavy weapons in populated centres. “The very clear implication was that the Government must stop first, and then discuss a cessation of hostilities with the other side and the mediator,” Mr. Fawzi said. The UN estimates that more than 8,000 people, mostly civilians, have been killed and tens of thousands displaced since the protests – part of the broader Arab Spring movement across North Africa and the Middle East – began in March last year. 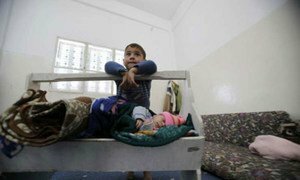 At least one million Syrians are in need of humanitarian assistance, according to the findings of a government-led assessment mission jointly carried out with the United Nations and the Organization of Islamic Cooperation (OIC), and released today.